Don’t forget that Sunday May 13th is Mother’s Day! 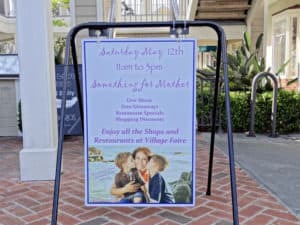 You can shop for something special for Mom at the popular Carlsbad Village Faire in downtown Carlsbad Village on Saturday May 12th from 11 am until 3 pm. There are abundant retailers and plenty of dining opportunities, and you can expect restaurant discounts, shopping specials, live music, some freebies, and no doubt will have a great time finding something special for Mother’s Day on Sunday. Or maybe take Mom along? There is plenty of free parking at the Village Faire as well as nearby, but you can expect a pretty good crowd. In case you are not familiar with the Carlsbad Village Faire, it’s at 300 Carlsbad Village Drive just west of the railroad tracks (on the north side) at the corner of Carlsbad Boulevard. Enjoy! !